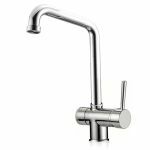 - N.1 REDUCTION OF BRASS M / F 1/2 "- 3/8"
- N.1 SFERA M / F VALVE 3/8 "
- N.3 FITTINGS 1/4 "- 3/8"
- N.1 TEST EVERYTHING QL2B IN / OUT 3/8 "
- N.1 1.5 MT TUBE FROM 1/4 "
If you already have equipment or machines that you want to use with water mixed with a Everpure professional system just plug in upstream of your plant this simple installation system takes up very little space and can be installed even with a minimum of hydraulic knowledge. Particularly suitable for replacing the refrigerant filter system (American type) with water dispensers and ice dispensers, just disconnect the already assembled filter and replace it with the ever more professional Everpure filter, a filtration quality of 0.5 micron and An atibacteric protection! Suitable for Everpure filter replacement and enhancement may be Samsung, LG, Whirpool, General Electric, Haier, Daewoo, Ariston, etc. 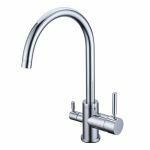 The system includes all accessories required for installation, wall outlet water outlet, filter inlet and outlet fittings, and 1.5 mt feed hose for each type of occurrence. The filter outlet tube is 1/4 "(6mm) which is usually adaptable directly to many water treatment equipment, if your water inlet is of different size, you can buy separately the fitting you need in our department Hydraulic fittings. The Cartridge is of Coal Pre-Coat type "Silver Microbiological Control" to ensure greater water-solubility. DO NOT ALLOW BATTERY OVERVIEW. It removes the cysts of Giardia and Cryptosporidium, the fibers of asbestos, chlorine, odors, colors, flavors, turbidity making the water safe, crystalline, good for drinking, for all food uses. - Pressure: The inlet pressure must not exceed 10 bar. - Activation: Flush the water through the filter at maximum pressure and at maximum capacity for at least 2 minutes to allow the air purge in the cartridge. We recommend the cartridge change every 6/12 months max. Irrespective of the autonomy of liters yet to be dispensed to provide greater safety, hygiene and healthiness of the water. 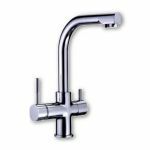 STAINLESS STEEL TAP TUBE WITH COMPENSATOR - M 5/8 "F 3/8"